First of all, I want to thank Péter Feldmájer and the wonderful Jewish community here in Hungary. 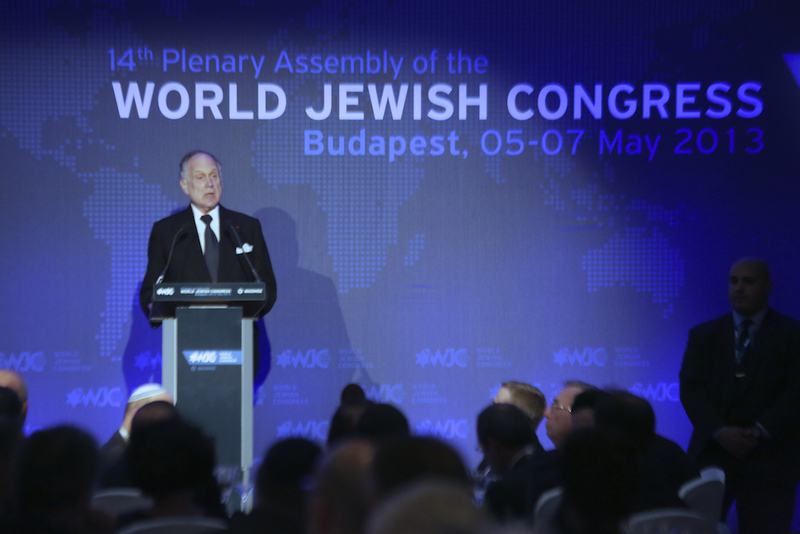 The fact that we are here tonight – representatives of Jewish communities from 100 countries around the world – is a tribute to the strength, resilience and vitality of Hungarian Jewry and to your leadership, Péter. Prime Minister Orban and Cardinal Erdö, we thank you for being with us. Your presence here tonight is also fitting because Budapest’s history is tied to Jewish history. Less than one hundred years ago, a quarter of this great city’s population was Jewish. Hungary’s Jews contributed to the country’s economy, its culture, and its universities as well as its extraordinary tradition of mathematics and science. Albert Einstein happens to be one of the few top physicists in the last century who was not born in Hungary but figures such as Szilard, Teller and Johnny von Neuman were just some of the brilliant Jewish minds that all came from Hungary and left a huge impact on the world. Joseph Pulitzer, one of America’s greatest newspaper publishers and the founder of the most coveted prize in journalism that still bears his name today came from Hungary. And of course, Theodor Herzl, who founded the modern Zionist movement that led to the creation of Israel is from here as well. My own mother’s parents were born here. The Lauder family dates back to the 13th Century, so you see my connection to Hungary is both deep and personal. But sadly, all of the famous Jews I mention – and there are many more – noble laureates, artists and scholars – all left Hungary because they were forced to leave. The rise of anti-Semitic parties in the 1920s and the 1930s led to the darkest chapter of all - the deportation and gassing of more than 400,000 Jewish men, women and children. A staggering one-third of the 1.1 million Jews murdered at Auschwitz were Hungarian. It is so clear that if these dark forces of anti-Semitism had not been allowed to rise in the 20th century – not just Jews but all Hungarians would have prospered. This always strikes me as so obvious – when Jews are allowed to live their lives freely and practice their religion, countries always flourish. It is obvious. But all too often, the irrational hatred that is Anti-Semitism defeats common sense. After 1920, the government of Admiral Miklós Horthy – a vicious anti-Semite – moved Hungary towards this irrational hatred. His government passed successive anti-Jewish laws and aligned itself closely with the Nazis in Germany. And in 1938, the Horthy regime enacted its version of the infamous Nuremberg Laws. The first deportations of Jews from Hungary to concentration camps began in 1941, on Admiral Horthy’s watch. I am recalling these facts now not because we are not familiar with them, but because today we are seeing, once again, growing ignorance, growing intolerance, growing hatred. Once again we see the outrage of anti-Semitism. This is by no means only in Hungary, but also in other places in Europe – in Greece, in Ukraine and elsewhere. We see that Jews and other minorities are singled out, vilified, demonized. We see that more and more people openly deny the Holocaust, which happens to be one of the most well documented tragedies in history. We see that a growing number of people actually believe the old canard that Jews control world finance, or the media, or everything. And we see that Jews again are being blamed for economic troubles. Today, there are members of the Hungarian Parliament who want the government to draw up “Lists of Jews” who hold public office. That sends out warning signals around the world. In the press and on television, anti-Semitism and incitement against the Roma minority are becoming commonplace, even accepted. We were shocked to learn that an anti-Semitic TV presenter was awarded a prize. We acknowledge of course that the prize was withdrawn. But the fact that it was awarded in the first place is the kind of thing that has us worried. Such words are reminiscent of the darkest era in European history. Let us never forget the Roma were also victims of the Nazi Holocaust. Today, Jews are again wondering whether they will have to leave the country, for similar reasons. Perhaps because they wonder why anti-Semites like Miklós Horthy are being glorified, and why statues honoring them are unveiled by Hungarian officials? Perhaps because they wonder if Jews have a future in Hungary? Whatever the reason, their concerns must be taken seriously. When Hungarian Jews are attacked by fanatics, they should be able to count on the unequivocal support of their government and of their authorities. It is the authorities that must stop this before it even begins. Mr. Prime Minister, I know that the Hungarian people love freedom. They are courageous. Hungarians, at important moments, have been models for the entire world. In 1956, Hungary was the first country to rise up against the Soviet oppressors. In 1989, it was Hungary that set off the chain reaction, which opened the Iron Curtain and brought down the Berlin Wall. Mr. Prime Minister, you were part of this. The fall of Communism paved the way for a rebirth not just of a new Hungary but also for the renewal of Jewish life in this part of the world that nobody had thought possible in the aftermath of the Shoah. I decided to support that Jewish renaissance as much as I could. In 1990, I established the Lauder Javne School in Budapest. It is now welcoming 600 Jewish students a year and enriching their lives with Jewish values. I am very proud of that, and tomorrow we shall all have a chance to see more of the children when we have dinner at the school. I have rebuilt synagogues here – showing my strong commitment to Hungary’s history and it's great heritage. Let there be no doubt: I still believe in the future of this country. And so do many others. Prime Minister Orbán, I thank you for your presence here tonight. It is no secret that Hungary’s international reputation has suffered in recent years. But Hungary’s good name was not smeared by the foreign press, but by extremists. Mr. Prime Minister, we are especially concerned about one particular party. I am talking about Jobbik, a party that won almost 17 percent of the vote in the 2010 elections. Through its anti-Semitism, its hostility to the Roma, and its paranoid rantings at the outside world, Jobbik is dragging the good name of Hungary through the mud. That same party held a demonstration just yesterday against our gathering here in Budapest. You have made many pronouncements. And your words are very important. Hungarian Jews need you to take a firm and decisive lead. They need you to take on these dark forces. They need you to be pro-active.They need your leadership in this fight. They need you to send the message to the entire population that intolerance will not be tolerated. And yes, that message must be repeated … and then repeated again. As president of the World Jewish Congress, I ask you to do precisely that and thus to demonstrate this great country's finest traditions. It is time for strong leadership and even stronger actions. We truly hope that you will be successful. Fascism and intolerance always single out the Jews first. But they are never the last victims. All good people suffer. Countries suffer. In the end, this hatred and intolerance only destroys a nation’s hopes, its progress and its future. Mr. Prime Minister, this hall is full of hope. We welcome you here at our gathering as you and the majority of your compatriots have welcomed us to your country. We thank you for being with us in your stunningly beautiful capital city.